It’s been a tough week for Homer Simpson. First, Daryl killed him in a “Walking Dead” tribute created by “Simpsons” artist Eric Keyes. Then, he almost got in on the selfie that broke Twitter. 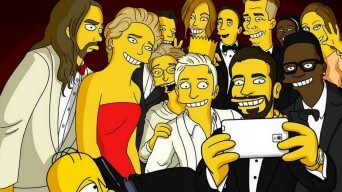 “The Simpsons” Tweeted out their own take on Ellen DeGeneres’ massive Oscars selfie. All of the stars were Simpson-ized, including Ellen DeGeneres, Lupita Nyong’o, Jennifer Lawrence, and Meryl Streep. Even Jared Leto — who was mostly cut out of the original — was fully present in this one. Posted March 6th, 2014 & filed under Entertainment.